Got Muddymusic’s Helifire (not to be confused with Hellfire by Toaplan) to look at. He bought the original cocktail cab and on first power up was met with nothing but a “loud noise”. His initial checks were that his +5v line was reading +2.5v and sent me the PSU to work on. Now due to the various AC voltages required to actually use the PSU I was unable to do any real testing so instead he sent me the transformer and PCB too. Now I could start checking the PSU I found that the +5v line was indeed around +2.5v. While I had the PSU powered up I suddenly got a +5v voltage output and it was pretty solid. 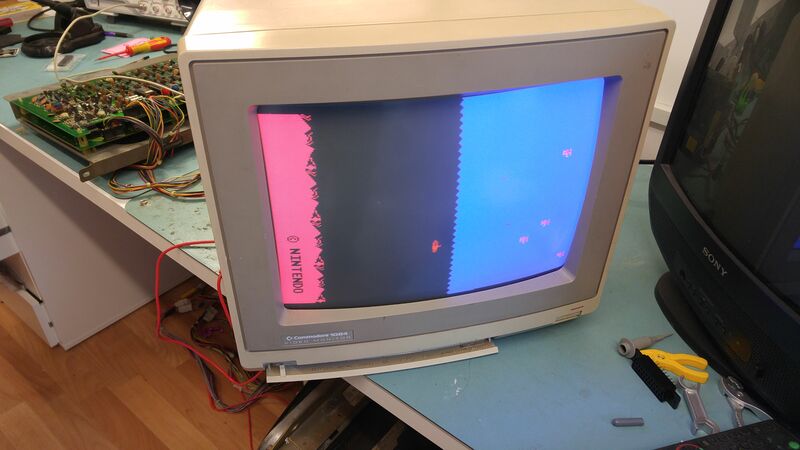 I couldn’t check to see if the game was running at this point as I had no way to connect the game to a monitor so I probed the video out pins with the scope and everything appeared to be at least what I expected. While I had the PCB hooked up to load the PSU I momentarily saw the voltage on the +5v line would drop to +2.5v and then to my horror rose up to +8v! I immediately powered it down and it has not been back on since. I opted to hook it up to a switcher but when I did I noticed the video sync output was missing. I guess the PSU took it out. I also noticed the 8080 CPU wasn’t running either and was getting quite hot. 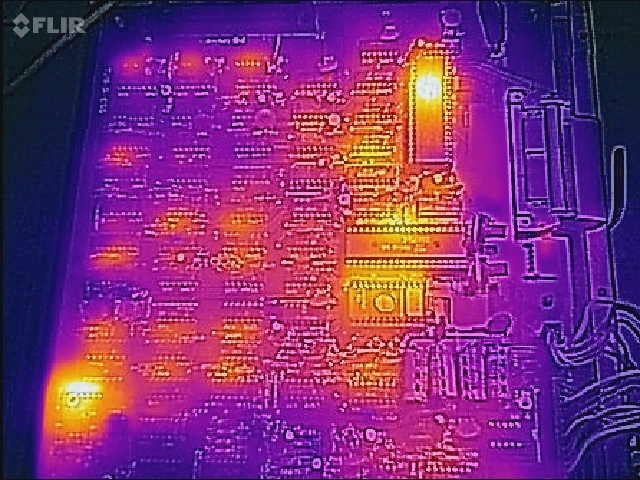 I’ve got access to a thermal camera right now so checking the PCB with that revealed the 8080 in the top right corner was way too hot. I had no spare 8080 CPU’s so placed an order for a couple and moved onto the missing SYNC signal. 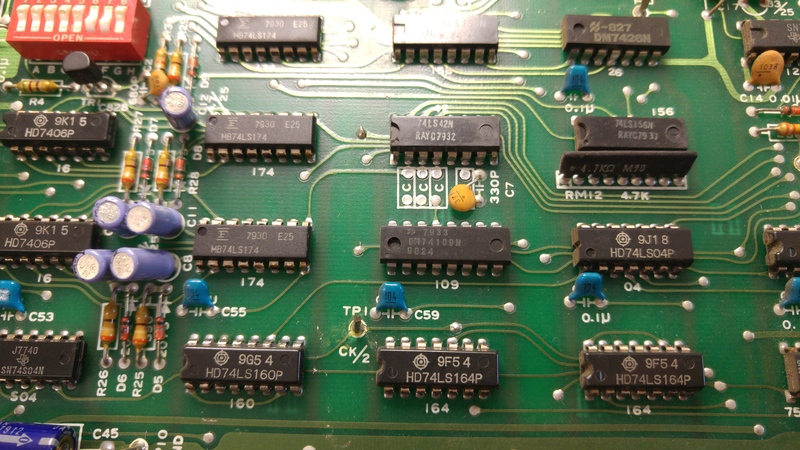 Working backwards from the SYNC output and using the schematics available I quickly found the 74LS109 at location 3B had stuck outputs despite having good inputs and a healthy clock signal. 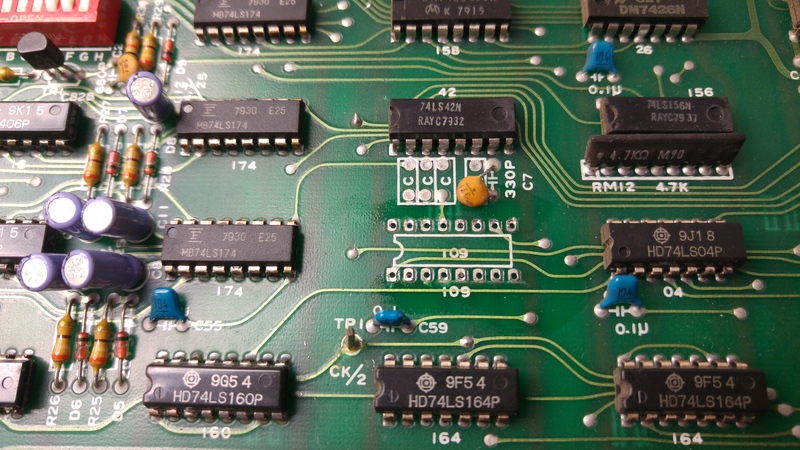 Replacing this chip gave me back my signals. A week later my 8080 CPU’s arrived and I managed to get the video output hooked up to my Commodore 1084D monitor to test. At the time I didn’t even realise that the game was black and white and uses a colour overlay so I was initially confused by the colour in the game but Muddymusic soon put me right on that.